F-Stop Magazine: How did you first become involved in photography and what led to you working in this medium as an artist? Kristianne Koch: I was attending university for architectural design and needed to take a photography class. I loved photography my whole life but never considered it an option for a career. In that class I met a woman who was talking about shooting with the 4×5 and alternative processes. I was mesmerized. She is still one of the most inspirational artists I’ve known although she doesn’t make work anymore. I’m proud to say I own one of her gum bichromate prints. Because of her I decided to change my major to Fine Art Photography and graduated BFA in 1991. However, after graduating I needed to make a living so I turned to commercial photography to support myself. I still do commercial work to support my fine art work. 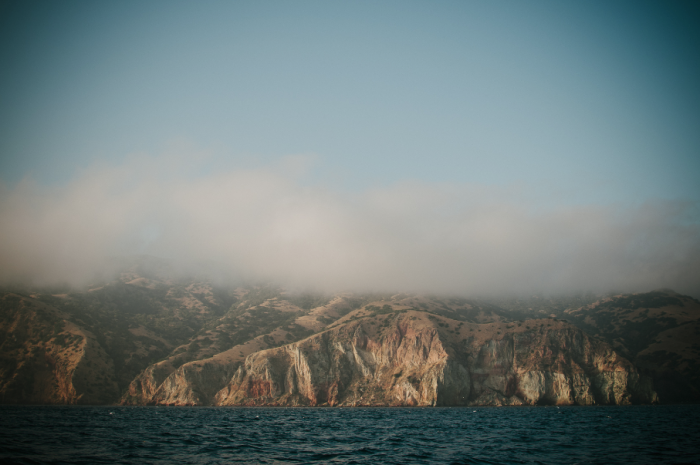 F-Stop: A lot of your work involves the ocean, what draws you to this as a subject? KK: I grew up in a surf town and sailing with my family on a small day sailer. I had always wanted to sail on a long term trip ever since I was very young. 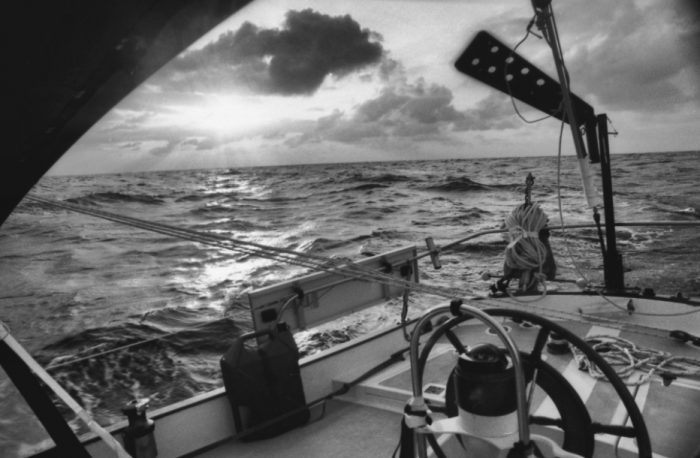 In the year 2000 my husband and I set sail across the Pacific in a 38′ sailboat. After 27 days at sea experiencing rough weather and emotional challenges where I would spend hours meditating on the light and texture of the ocean and sky, I would definitely say that I became deeply connected to this mysterious medium during that time. The middle of the ocean is a scary, magical place that feels otherworldly and I think we can all relate to being drawn to the ocean’s beauty and intimidation. F-Stop: You photograph your family in some of your projects. Can you discuss your process for making these images? How do you decide what to photograph? Do you intervene in events at all, ask people to hold still, or move to better light, or ask them to do something in particular? KK: I began photographing my family because they were handy subjects. I didn’t realize that I would learn so much about myself in the process. I lead an intentional life and have always been very introspective but when I began photographing my children I realized I was learning something deeper about myself-my values, my fears and my hopes-that I had never admitted to or explored before in my work. I rarely ask them to hold still or move somewhere for the light. I might ask them to repeat something which is natural for them because they love to jump in the ocean over and over! I observe their mannerisms and their interaction with the light then just capture that. It has taken me years to be in tune with this process. I used to get upset that they wouldn’t do what I asked them to do or that they were overly goofy or happy in my shots. Then I realized they were already doing what I needed them to do-be themselves and guide me to my vision. I have come to appreciate their liveliness, their quirkiness and their imperfections as fine art subjects. 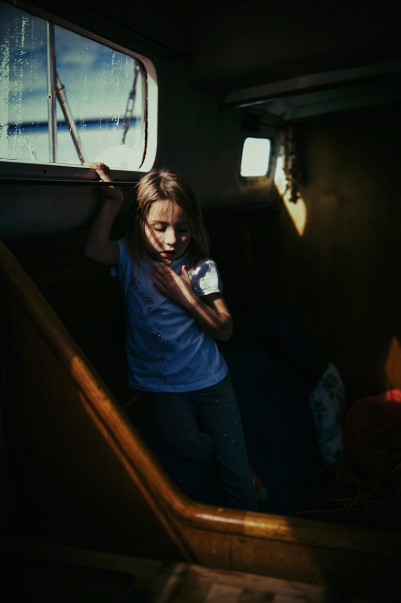 F-Stop: I find that I really relate to your imagery of the ocean as sublime in your series “At the Edge” and I want to go sailing with you in your “dreams on board” series…I have always been drawn to the ocean myself. What do you hope people see or feel or perhaps learn when they look at your photographs? KK: I love that the ocean is universal and that everyone has their own way of relating to it. 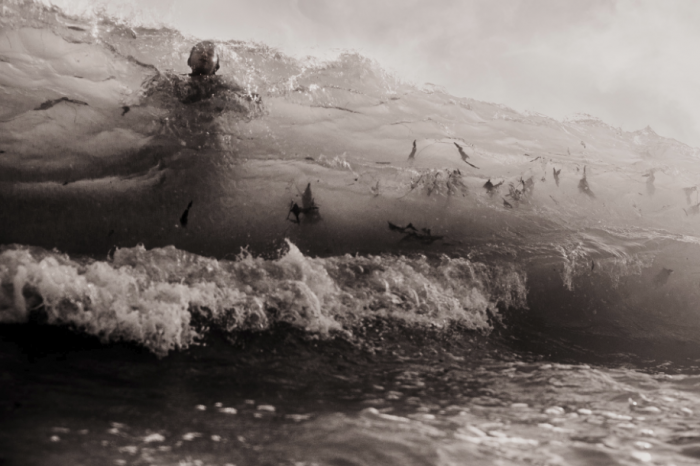 I have had feedback from sailors about my work that, “That’s exactly what the ocean looks and feels like way out there!” and I have also had comments that my images confirm people’s trepidation of the ocean. Dreams On Board is meant to inspire others to give life to their own dreams no matter how small or imperfect or unpopular they may seem. I do hope that my work encourages others to realize that we all have fears and vulnerabilities yet we are all capable-capable of making good choices for ourselves, of challenging ourselves to move past vulnerabilities and to be free to live our dreams. If we can learn to let go of our fears, our self limiting ways and stop blaming others for our feeling of inadequacy then we can all be happier, more creative and more fulfilled. F-Stop: Do you have a favorite image from your portfolios? If so, which one and why is it the image that speaks to you most? 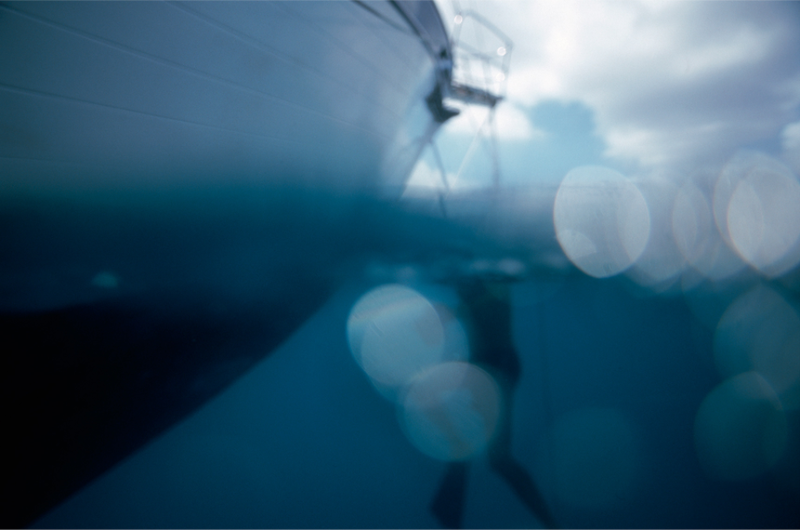 KK: I would have to say that my favorite image is the one of my husband checking the bottom of the boat at sea level in the series Makai-Toward the Sea from 2000. It is the image that gave rise to all the others. My husband was inspecting the hull of our sailboat after we had spent hours kedging the boat off of a reef in the Tuamotus. I got in with my water housing to photograph the damage. I was experiencing something that was terrifying yet beautiful at the same time. It was a summary of our entire trip around the Pacific. I didn’t see the processed film for another five months but when I saw that one particular slide I knew that it represented a convergence of all my inspirations. I enjoy finding peace in things that are out of my control and shooting in the ocean continues to allow me to experience that. F-Stop: What are you working on now? KK: I actually have several projects I’m concurrently working on but one is clearly in progress. It brings together my commercial and fine art backgrounds. I am photographing families with an 8 year old child to create triptychs for the Age of Enlightenment series. I wanted to ‘construct’ images to express my idea and honor the period of growth and the families experiencing it. The idea was inspired by my own family’s changes as my son was turning 8-approaching the Age of Reason according to the Catholic Church. As I started to talk to parents of my son’s friends, I came to understand that my son’s process of pulling away was a common development for all children around this age. It has been a very emotional project for me and I tend to take a long time to allow things to unfold so the work is developing slowly. I am presenting each final piece as a custom altarpiece-type artifact. They are quite costly to create so at the same time I am researching grants and additional funding for the project. KK: I have been inspired by many photographers over the years. Initially my inspiration came from Ansel Adams and the artists of the Pictorial Era-especially Clarence H. White and Edward Steichen. As my tastes tended to evolve toward a more contemporary style I have been inspired by Cig Harvey, Julie Blackmon and Aline Smithson’s work. The deepest and most long lasting inspirations for me is the work and perspectives of Marcel Duchamp, Bill Viola and my husband, an award winning creative director. Kristianne is our daughter in law and we’ve been so fortunate to have such a talented photographer capture all the special moments in our lives. We’ve so proud that she is receiving the (much deserved) attention from the public! Love the active roll your work has taken in finding a deeper understanding of your family, so true when you can sit back and observe rather than critique. What a great interview! It’s so interesting to hear from the artist themselves and learning their inspirations says a lot. Great work! !